Duplicate the typing tool layer. 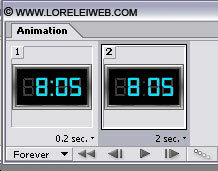 On the duplicated layer, type different digits, for instance – 6:05. Use an eye hurting blue colour of your choice. WE used #04e3fd, but you can use a different hue, even green or red color in the first place. Make sure that your new layer lays exactly over the grey digits. You can add a bit of outer glow with the same blue colour if you want, to make it more shiny, but it’s not a must. and this will be your image nr. 2, save it as 2.jpg to the new folder where the first image is stored. Go to File >> Import >> Folder as Frames… and select the folder where your two images are located. Set these time settings for the animation. That’s it, here is your result! Hope your enjoyed the tutorial! Pingback: 15+ Cool Animation Photoshop Tutorials | Tutorials Share | Tutorials, Resources & Tips for Designers!